With the recently published Seventh Edition of Ecology: The Economy of Nature, the landmark text that helped define the introductory ecology course became the first textbook to fully embrace the challenges and opportunities of teaching ecology today. Now that acclaimed resource is available in a new version designed exclusively for Canadian instructors and students. 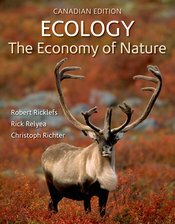 Ecology: The Economy of Nature, Seventh Canadian Edition maintains Robert Ricklefs’ signature evolutionary perspective and the latest edition’s dramatically updated pedagogy, and design, but this version focuses on a wide range of vivid examples from across Canada, as well as breakthrough research from Canadian scientists. It is an ideal way to communicate the fundamental ideas and high-impact relevance of the science of ecology in a Canadian classroom. Ecology: The Economy of Nature, Canadian Edition is accompanied by a dedicated package of Canada-specific student and instructor resources, including PowerPoint sets, optimized art, a test bank, online quizzes, and its own version of W.H. Freeman's acclaimed adaptive quizzing engine, LearningCurve.